It’s an expat’s nightmare. You pack up your home, your spouse and your kids, and jump on a plane to begin your new job in a Third World country somewhere on the other side of the world. The flight there is thankfully uneventful (in other words, the kids didn’t drive you and everyone else on the plane crazy), but when you land, your new employer’s representative, who was supposed to meet you at the airport, is nowhere to be found. Thanks to the kindness of a stranger, you make it to your hotel but it’s not exactly the Shangri-La. There’s nothing to watch on TV, there’s no Internet connection and there’s no complimentary newspaper waiting at your door. The front desk clerk informs you that you have to go outside to get one of those. You tell yourself that it’s just one more thing that you’ll find funny later on as you head outside. But then you stumble into protest between heavily armed police and a mob that doesn’t look like it’s going to back down. All hell breaks loose. You run for your life back to the safety of your hotel only to find that the mob is already there executing anyone and everyone. It turns out this isn’t an everyday protest. The mob leaders are ultimately after you. 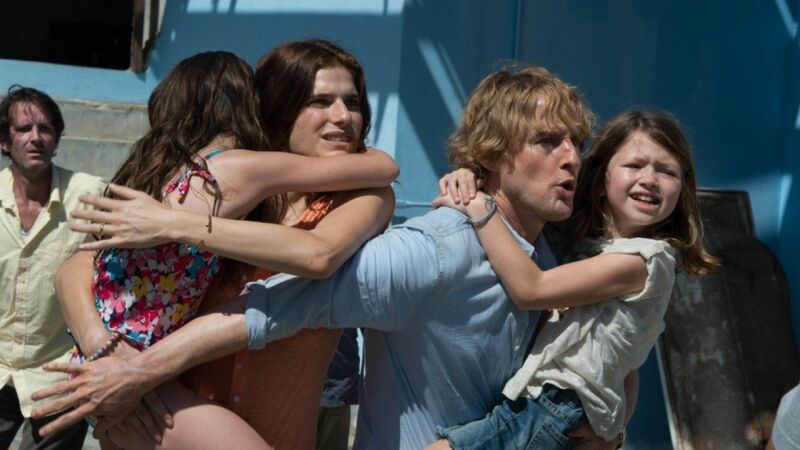 NO ESCAPE is 101 minutes of non-stop thrill. Owen Wilson (SHE’S FUNNY THAT WAY) stars as Jack Dwyer, an unlikely hero who digs deep to find the strength to save himself and his family from a certain death. Lake Bell (best known for her role in TV’s BOSTON LEGAL) plays his wife, Annie, who also discovers that she will do anything and everything to protect her family. Pierce Brosnan plays the “Asia hand” who befriends the Dwyers on the flight over. This isn’t Wilson’s first serious role – he starred in the action drama, BEHIND ENEMY LINES, in 2001 – and he shows that with the right script he can to do something other than comedy. Smartly written, Jack Dwyer is neither a MacGyver nor a Rambo. He’s just an everyday family guy who gets caught up in a situation that no one ever expects to find themselves in. He’s both clever and desperate enough to keep his family a half a step ahead of the mob. Each time it looks like the Dwyers have come to a literal dead end, both Jack and Annie pull out all the stops to give themselves a few more minutes of life. After watching this film, you can’t help but ask yourself (and your spouse) to what extremes you would go to protect your loved ones. The reality is you never know until you’re looking at those life-and-death choices straight in the eye. The locale for all this mayhem is an unnamed country in Southeast Asia, though the parallels with both the capture of Phnom Penh in Cambodia by the Khmer Rouge in 1975 and the street protests in Thailand in recent years are obvious. Presumably, so as not to upset his Thai hosts (the film was shot in central and northern Thailand), director John Erick Dowdle went to great pains to swap out all the street signage for ones written in Khmer. Unfortunately, he blew it when it came to the police shields though. The script was upside down and that was the straw that broke the camel’s back for the Cambodians. That country’s Ministry of Culture and Fine Arts has now banned the film from being screened there. I’ll concede that the premise of the story is somewhat far-fetched, not to mention being a tad xenophobic as well – neither the Khmer Rouge nor the Red Shirts went after foreigners – and it’s never really clear why Jack’s company is at the center of this storm, but it is good entertainment. So suspend all logic and any thoughts of political correctness, and strap yourself in. It’s a wild ride!